When I first started this blog, my motivation was to provide the English speaking public with an alternative account from the mass media nonsense that was being presented to them as "Iran news". I was urged by people in Iran who were telling me the Western media correspondents in Iran, to avoid getting deported, were painting an unrealistic rosy picture of what was happening there. Lack of objective reporting coupled with lazy journalism is misleading the international public in an alarming way. So often, a correspondent writes his own politically motivated narrative as news, it then gets copy/pasted by others and before you know it; a media myth becomes an established fact! One glaring example of this type of media myth, not specific to Iran news, is what the Western media refer to as the "1982 Hama Massacre" in Syria. Headlines suggest anything between 10,000 - 40,000 people were massacred and reading the articles one would get the impression that the Syrian government simply gunned down anything up to 40,000 peaceful Syrian protesters in the street! The truth however is none of the journalists who have copy/pasted the Muslim Brotherhood's preferred narrative have ever bothered to look into the facts of what happened in Hama in 1982 and continue to mislead the public. 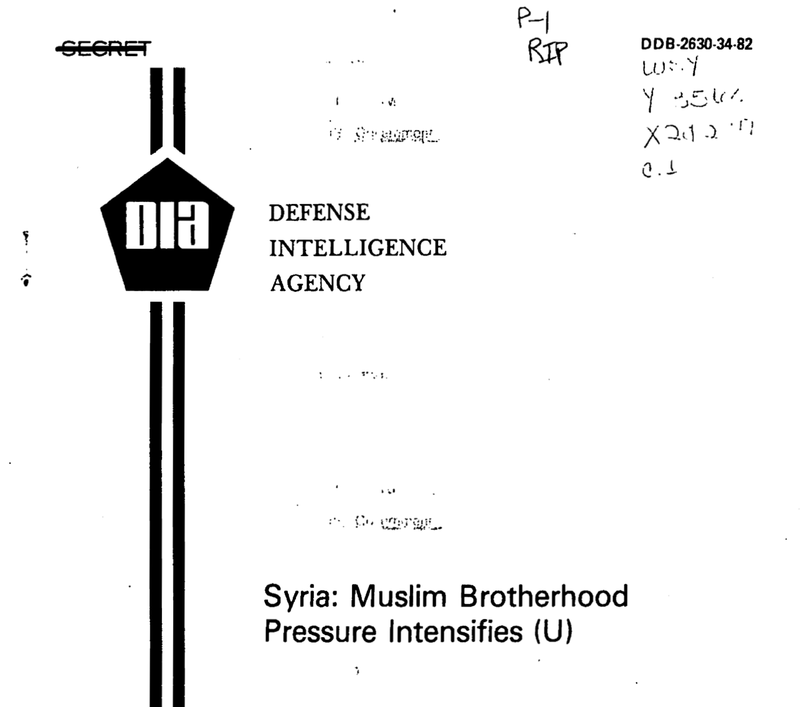 A more reliable source of what really happened in Hama in 1982 is the previously classified DIA [Defence Intelligence Agency] report published in May 1982. According to this report, the Syrian Muslim Brotherhood, encouraged by the Islamic Revolution in Iran, planned an attack to trigger a similar revolution to Iran in Syria, by massacring 50 young Alawite cadets, which they thought would encourage the Sunni Muslims of Syria to commit similar sectarian killings of other religious minorities throughout Syria. The Muslim Brotherhood does not consider Alawites to be Muslims and they considered the change of the Syrian constitution in 1973 which deleted any reference to Islam as the religion of state, to be a heretical move against Islam. Despite some meticulous planning by the Muslim Brotherhood, which involved their sophisticated use of propaganda and media networks, they suffered continuous setbacks which prompted them to unleash a premature rebellion in Hama. The Syrian Muslim Brotherhood even provisioned that in the event the uprising failed, it would become a symbolic rallying point for their future activities and media propaganda, which is exactly what we are witnessing today. According to the DIA report, on February 2nd, 1982, following a clash between Muslim Brotherhood and Syrian security forces, loud speakers on top of the mosque minarets in Hama, called on their followers to begin a holy Jihad against the government, even telling them at which specified mosques weapons were available. Teams of trained Muslim Brotherhood operatives who had even infiltrated into the Syrian armed forces, moved in their army uniforms to attack government targets, following the calls from the minarets. The DIA report estimates the numbers who took part in the attacks and drove out the government forces to have been around 1000, so a tiny minority of the population, but one that was well organised, well motivated and well armed. By 9th Feb, Muslim Brotherhood communiques, whose sources stretched from Hong Kong to Vienna, boasted that they had killed 3000 government troops, which included the summary executions of "spies and informers". Voice of Arab Syria radio, stationed in the rival Ba'athist state in Baghdad continued calling Syrians to join the holy Jihad. Far from the sensational media headlines of 30,000 to 40,000 massacred in Hama, the DIA report concludes the total numbers killed during the February 1982 crackdown on the Muslim Brotherhood in Hama, number around 2000 which includes an estimated 300-400 members of the Muslim Brotherhood's elite Secret Apparatus. Whether it is because of infiltration by the Muslim Brotherhood or sheer fear of the organisation, the massacres committed by the Muslim Brotherhood never seem to receive any public condemnation by the Western media or the officials in the West. There is never any legal moves against the assets and bogus charities held by the leaders of the Muslim Brotherhood, who have spread themselves throughout Europe. Leaders in the West fearing to be seen as Islamaphobes or upsetting "religious sensitives" than moving against the Muslim Brotherhood's organisation, seem to have given this secretive fundamentalist outlet, immunity to spread its tentacles throughout the European state institutions. Obama's naive administration desperately seeking to partner with a "moderate" Muslim organisation, foolishly went to bed with the Muslim Brotherhood. An example of this catastrophic lack of judgement can be seen in this video when Obama's Director of National "Intelligence"(? ), James Clapper, called the Muslim Brotherhood in Egypt "largely secular"! What an utter fool! Was James Clapper's outrageous gullibility, just sheer credulousness or was it a demonstration of how far the Muslim Brotherhood ranks have spread their influence in the West? Either way, the voters in the West, when choosing their leaders and officials must think hard about where their representatives stand in ensuring a secular future for their children. Before paraphrasing the lazy journalists in the media in condemning the "Hama Massacre", think about what would happen if an ideologically motivated, well organised, armed and violent group stage a holy Jihad, in a European city, attack government targets, start beheading female nurses and teachers not wearing the Hijab and publicly execute other civil servants as "spies and informers"? Excellent, Potkin. Too bad the know-it-all NYT columnist, Thomas LHR. Friedman, didn't do a better job researching his book "From Beirut to Jerusalem" before spreading the MB propaganda about a 'massacre' of 20,000. This bogus claim has stuck ever since.